A lifelong love affair for fun and good times. Located in the heart of one of the country's most romantic cities, Deanie’s Seafood Restaurant—known for its succulent seafood, Southern hospitality and hearty portions—is an ideal location to celebrate your wedding. 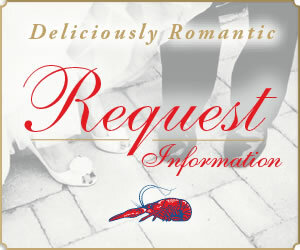 As you plan your wedding, please consider sharing some of the activities associated with this special time with us at Deanie’s Seafood Restaurant in New Orleans’ historic French Quarter. Deanie’s Seafood offers an intimate and upscale venue to host your wedding events in the Vieux Carré. Our French Quarter restaurant has private rooms that open onto a classic courtyard for an intimate soirée or big bash. Deanie’s Seafood can make your special wedding celebration a party to remember through our professional banquet and catering services, and attention to detail. Deanie’s offers two private dining areas, the Madden Room and Iberville Room, and a traditional Vieux Carré courtyard perfect for private parties, special occasions and celebrations. A family-run business with 50 years of creating culinary memories in New Orleans, Deanie’s Seafood is proud of its heritage of serving fresh Louisiana seafood prepared with Deanie’s signature seasonings. Our authentic New Orleans cuisine is nationally renowned and featured on various Travel Channel and Food Network programs, and its recipes have been showcased in Gourmet magazine and cookbooks such as Chef John Folse’s “Hooks, Lies and Alibis.” Deanie’s is consistently recognized by locals as the “Best Seafood Restaurant in New Orleans.” In addition to its well-known seafood specialties, Deanie’s’ banquet and catering menus include a wide variety of appetizers, entrées, desserts, and passed hors d’oeurvres and plentiful chicken, beef and ham selections, non-fried items, vegetarian and gluten-free options. Our sales and catering staff can help plan a menu that meets all of your catering needs while exceeding your expectations for an elegant or casual private dining experience. To ensure a flawless event for you and your guests, your party will be fully staffed with station attendants, banquet servers, bartenders as well as an event coordinator and manager. Deanie's Seafood in the New Orleans French Quarter is a great location for Rehearsal Dinners and wedding parties. Our French Quarter restaurant is located only steps from Bourbon Street and is in the heart of the French Quarter. New Orleans is one of the top romantic Destination Wedding cities. Couples flock to the New Orleans French Quarter to have small intimate weddings with friends and family. Deanie's Seafood is the ideal location for hosting your rehearsal dinner. It is also great for New Orleans wedding parties, bachlorette dinners, bachelor dinners, family wedding dinners, small receptions. Deanie's Seafood delivers the fun and good times needed for an amazing wedding party in the New Orleans French Quarter.